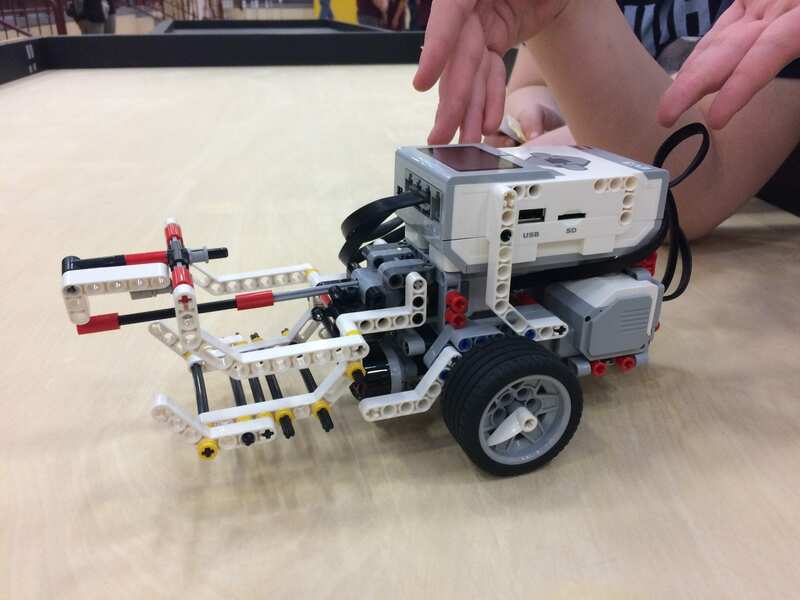 Murphy Bulldogs | Cherokee Co N.C.
CHEROKEE, N.C.- Forty-eight schools across the state competed in the FIRST (For Inspiration and Recognition of Science and Technology) Lego League (FLL) robotics competition hosted by Cherokee High School in Cherokee, North Carolina, Saturday, Dec 2., 2017. The Lego League is the elementary and middle school version of FIRST Robotics. In the state of North Carolina, North Carolina A&T State University (N.C. A&T) serves as the affiliate partner (AP) for FIRST Lego League and FIRST Tech Challenge. The theme for this year’s FIRST Lego League competition is hydrodynamics. The teams had to design a robot that would show how to improve the way people find, transport, use or dispose of water. North Carolina is a two-division championship tournament region between eastern and western North Carolina. The top 13 finalists from both the eastern and western regions, will compete at the state competition. Only 13 schools from the western division were able to advance to the state competition, and out of those schools, Murphy Middle School and Martins Creek Elementary were two of the schools that will be advancing. The region that wins at the state competition will then go onto the southeastern competition, which will have teams from several different states in the southeastern United States. BMS Robotics – Brevard, N.C.
Hydro Knights, Fairview School – Sylva, N.C. The HydroMechanics, Fairview School – Sylva, N.C.
Minifigures, Cullowhee Valley School – Cullowhee, N.C. Programming Professionals, Shining Rock Classical Academy – Waynesville, N.C. Chaotic Robotic, Martin’s Creek School – Murphy, N.C.
Koontz Battering Rams, Koontz Intermediate School – Asheville, N.C. Circuit Overload, Murphy Middle School – Murphy, N.C. Accidental Genius, Summit Charter School – Cashiers, N.C.
Tarheel Terminators, Smokey Mountain School – Whittier, N.C.
Lego Lords, Summit Charter – Cashiers, N.C.
Hydrobots, Macon Middle – Franklin, N.C.
Narwhal Nation, Cullowhee Valley – Cullowhee, N.C. The state championship will be held January 20 and 21, 2018, in Greensboro, North Carolina, on the campus of North Carolina A&T State University. Murphy High School had a impressive turnout for seniors to sign the letters of intent that were handed out on Nov. 8, 2017. A couple weeks later, I had the privilege of sitting down with a few of Murphy Bulldogs best athletes. Royce Peterson, Caleb Irwin and Nathan Barolet were three of the scholarship recipients, who signed their letters of intent that day. Royce Peterson love for baseball started at the age of four. He plays third baseman, which he said is his favorite position. Royce credits his success to his family and coaches, but one coach in particular is his one of his travel baseball coaches Tom Paciorek. Paciorek was a MLB player from the 1960’s-1980’s. Paciorek has used his professional knowledge of baseball to help Peterson with his swing and form at the plate. Peterson has maintained a 4.15 GPA while staying busy with travel baseball along with playing high school baseball. He signed a 4 yr scholarship to Emmanuel College in Franklin Springs, Ga. I asked him what he foresees his first year in college to be like, he said that he will be busy with training and his studies. Caleb Irwin stepped on the baseball diamond at the age of four. Throughout high school, he has maintained a 3.9 GPA while staying busy with his high school and travel baseball activities. He is a right handed pitcher for the Bulldogs varsity baseball team and his travel baseball team, with a clocked pitch speed of 88 mph. When I asked Caleb how he plans his first year at college to be, he responded with “It will take some adjusting, but I will be focusing on baseball, and my studies. That is the most important.”. Irwin will be attending Lawson State College, in Birmingham, AL. He will major in sports management along with keeping up with his college baseball career. 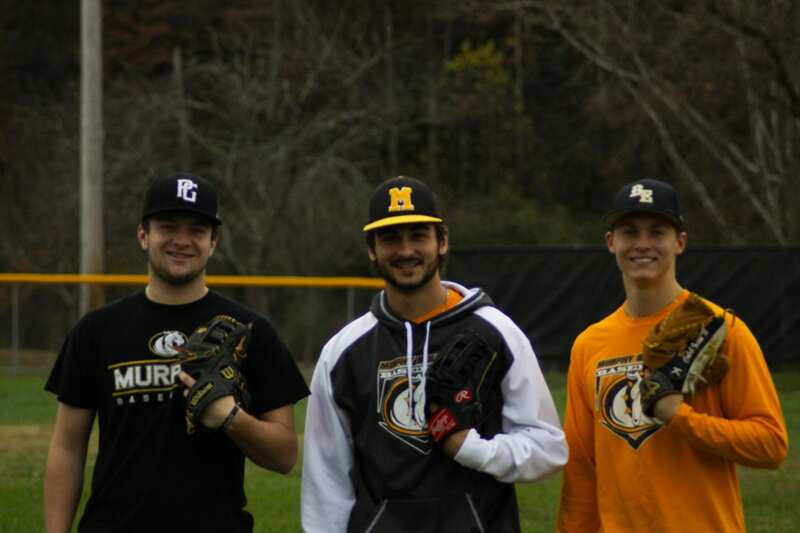 Nathan Barolet is a varsity baseball player who came to Murphy High School from Hayesville High, for the possibility for more chances in his baseball career. Having changed schools a few times, Barolet has never let it kill his passion for baseball and has kept his GPA up. He has outdone himself by standing out in new schools and proving what he has to offer. Gardner-Webb along with quite a few other colleges including UNC reached out to Nathan with scholarship offers. However, Gardner-Webb was more appealing to Nathan because he felt it was the best fit for him. Nathan is undeclared for right now, but he plans to focus his first year of college on prepping himself for the first season of college baseball. After sitting down and talking with these young men about their dreams and goals in life, I have to say one of the things that stands out about all three of them is how they have their priorities in check. The fact that these young men manage to accomplish this incredible high school baseball career, which led them to college, is absolutely amazing. 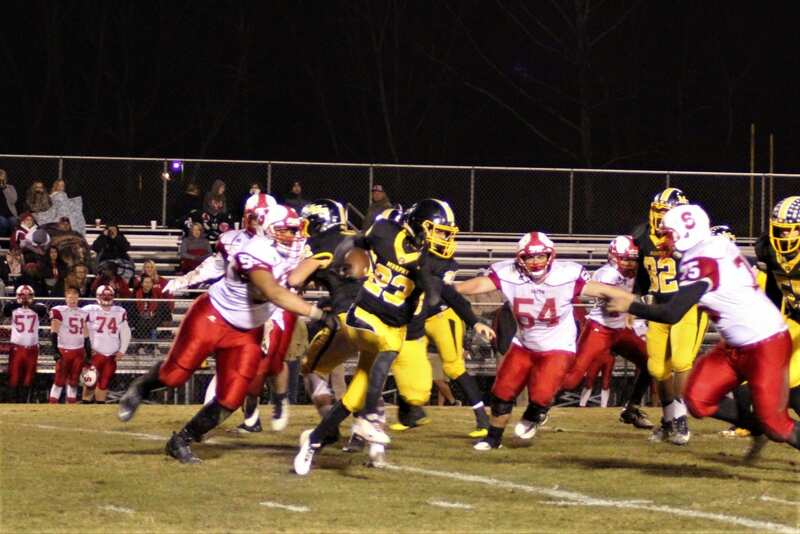 MURPHY, N.C.- The Murphy Bulldogs won Friday’s game against the East Surry Cardinals, which secured the bulldogs place in the final regional game being held in Mount Airy this Friday Dec 1, 2017. As the team captains took the field, the bulldogs won the coin toss, showing the coaches had great faith in their defense. The coaches would not be disappointed. After a strong defensive showing by the Bulldogs, Chase Roberts (#40) ran for 1-yard to put Murphy on the board first, with a 7-0 lead following the perfect PAT by Katelyn Jones. A few plays follow the kickoff, Tanner Creelman (#25) picked off a pass to give the ball back to the explosive Murphy offense. 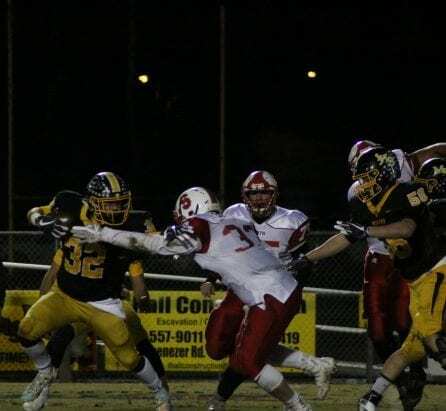 Joey Curry (#1) and Slade McTaggert (#32) took turns chopping up the Cardinals on the ground as the Bulldogs pounded the ball upfield, until Curry connected with Micah Nelson (#2) for a 54 touchdown strike. Jones aced the PAT and the Dogs were rolling, 14-0. Roberts, who plays both sides of the ball, came away with the second interception of the night for the Bulldogs on the next series, and an unsportsmanlike conduct call against the Cardinals put the Dogs right back in scoring position, but they were unable to capitalize on this possession. 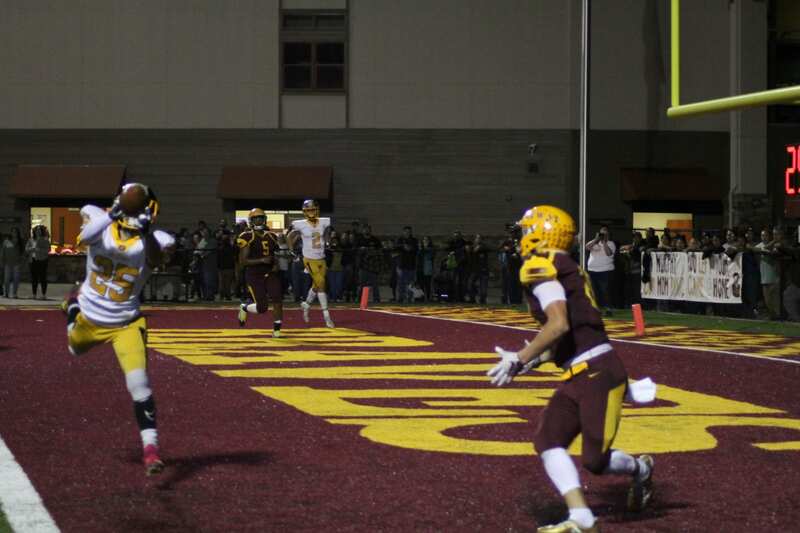 As the quarter came to a close, Murphy was in control of their own destiny with a 14-0 lead. With 11:54 remaining in the half, East Surry finally found the end zone, cutting the lead to 7. It wouldn’t take Murphy long to answer, however, as Devonte Murray (#28) carried the ball from 5 yards out on 3rd down to put Murphy back up by 14. PAT good, 21-7. Murphy would put another touchdown on the scoreboard before the half, completely dominating on their way to the final four in the 1AA State Championship brackets. 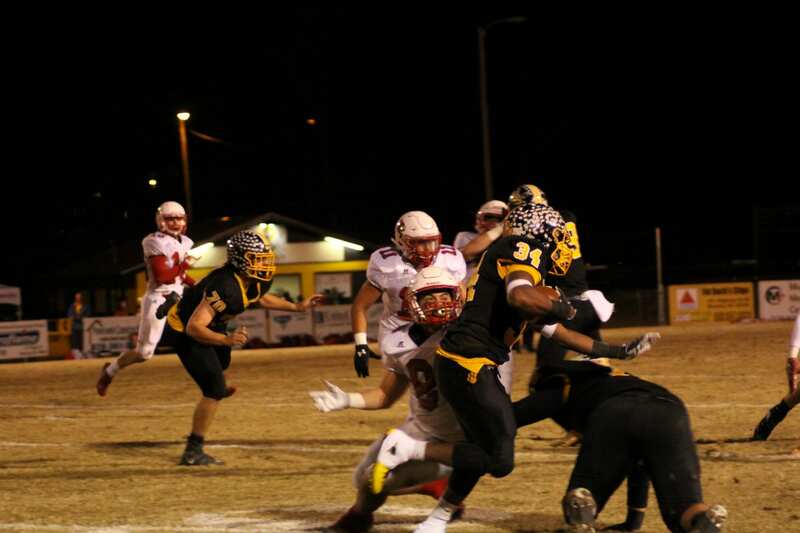 Bulldogs McTaggart (#32) rushed for a team-high 180 yards and two touchdowns. It was the Bulldogs #40 Chase Roberts who lead the team with three touchdowns, of which two being scored in the first half of the game. Bulldogs senior QB #1 Joey Curry completed 6-of-12 passing attempts with one touchdown in the game. The Bulldogs once again showed their strength on the ground, with a rush-heavy offense, rushing for 437 yds, with 103 pass yds respectively. East Surry struggled on the field with several penalty flags being thrown for unsportsmanlike behavior and personal fouls. After all was said and done, East Surry somehow managed to score four player ejections from the game for these penalties, but falling short on the win against Murphy. In the end, the Bulldogs won the game with a final score of 49-27. 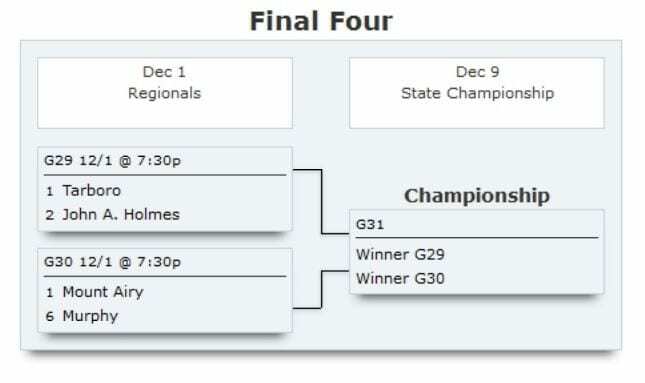 The Murphy Bulldogs will go toe to toe with the Mount Airy Granite Bears (13-0,5-0) for a spot at the state championships. If the Bulldogs defeat Mount Airy on Friday, then this will be the Bulldogs 12th time since 1972 going to the state championships. 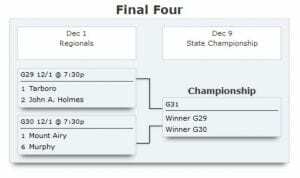 Below you will find a list of the final four teams who will vie for a spot in the state championship game. It was freezing cold last night when the Murphy Bulldogs (10-2,5-1) played against South Stanly (5-7,4-3)in the first round of playoffs. You could tell the Bulldogs were ready for a battle before the game started. The boys were pumped along with the coaches as they embarked on their journey towards the first game of the playoffs. Murphy won the coin toss, but elected that South Stanly kick off with Murphy to receive the ball. #89 Travis Seabolt returned the ball to the Bulldogs 47 for 12 yards. With 7:50 mins left in the 1st Q, the Bulldogs scored the first touchdown and the PAT was good by #3 Katelyn Jones. #10 Kaivon Allen scored a 21 yard touchdown. A two-point conversion was attempted and made good by #10 as well. QB #1 Joey Curry scored the third touchdown, but the two-point conversion that was attempted by #32 Slade McTaggart was unsuccessful. This bringing the score to 21-0. In the 2nd Q, #1 Joey Curry threw a pass incomplete to #12 Hagan Newton to the Bulls 17 yard line for 0 yards . A penalty was handed to South Stanly for defense roughing the passer for 15 yards. It wasn’t as if the Bulldogs needed any help with scoring, but the Rebel Bulls scored a safety for which brought the already embarrassing score to the 30-0, Bulldogs. It seemed as if South Stanly came back in the second half a little more charged, scoring 13 points. Unfortunately the possibility to win was long gone in the first half of the game. The final score was 44-13, Bulldogs! Murphy will face off against North Stanly in New London, NC for the second round of playoffs, this Friday November 17th, 2017, with kick off starting at 7:30pm. The Murphy Bulldogs snatches The Cherokee Braves Undefeated season record 35-12! Cherokee, N.C.- The Murphy Bulldogs game Friday night against The Cherokee Braves was an intense game no doubt! Previously, Cherokee was undefeated until the Bulldogs came in and handed them their first loss of the season. A few weeks ago, I interviewed Murphy’s Coach Nelson, a statement I remember was the coach answering with “These boys are a second half team. They come back stronger.” Well, that statement proved to be true. In the 2nd Q, it was Murphy’s #32, Slade McTaggart who score the first touchdown followed by #3 Katelyn Jones making good on the PAT. It wasn’t until the 3rd Q when the game started to pick up. Murphy scored two more touchdowns, while Cherokee was just making their first touchdown of the game by #5 I Evans. PAT by #30 T Pete was no good. The 4th Q Murphy came in even stronger by scoring three more touchdowns with every single PAT being good. Cherokee was finally able to score their last and final touchdown, again, by #5 I Evans. That PAT was blocked however. This Friday, The Murphy Bulldogs will have a home non-conference game against South Stanly (5-6,4-3) from Norwood, N.C. @7:30 pm November 10th, 2017. Come cheer on The Murphy Bulldogs and show that Bulldog pride! Next Article » BKP's Opening Today - Why Did Donna Brazile Mention Seth Rich in her Book ? Murphy, N.C.- Friday night, The Murphy Bulldogs (8-2,4-1) hosted a conference game against The Rosman Tigers (2-8,1-4) for their Senior Night. For many of the players, this would be their last home game as a Senior at MHS. Lot’s of proud parents walked their children onto the field with a look of pure joy. The coaches gleamed with pride and proudful expressions as the Seniors walked onto the field. It was bittersweet. It was a cold night temperature wise, but the Bulldogs wasted no time at warming up the field with their impressive win against the Tigers. The final score was 48-22! The first TD was scored by #10 Keivon Allen for 16 yds followed by a PAT by #3 Katelyn Jones. In the 2nd Q, #28 Devonte Murray was handed the ball and scored a 21 yard TD. QB #1 Joey Curry followed up with three more TD passes with #3 Katelyn Jones making good on 3 of the 4 PAT’s. The 3rd Q, Murphy score 2 more TD’s bringing them to a score of 48. 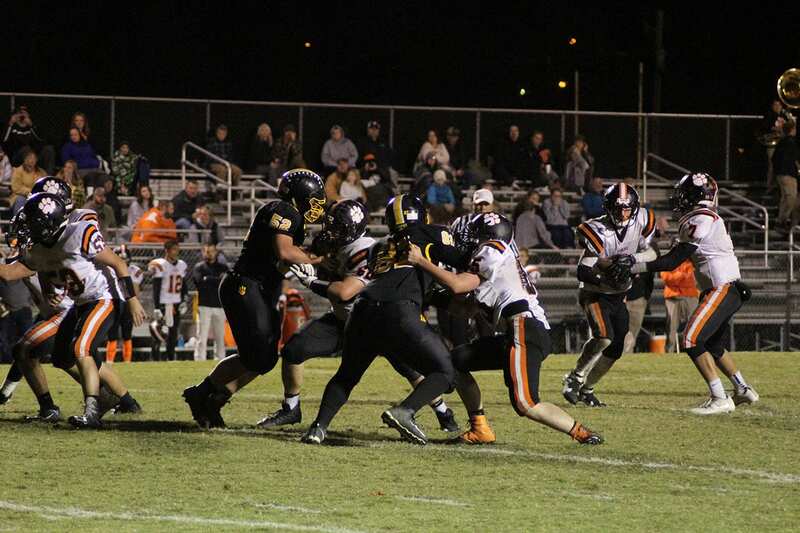 Despite Rosman’s 3 TD’s and 3 onside kick recoveries, they fell all too short to The Bulldogs dominating defense. This Friday, November 3rd, come out and show your Bulldogs support when they face off against Cherokee in a away game. Kick off starts @7:30pm! 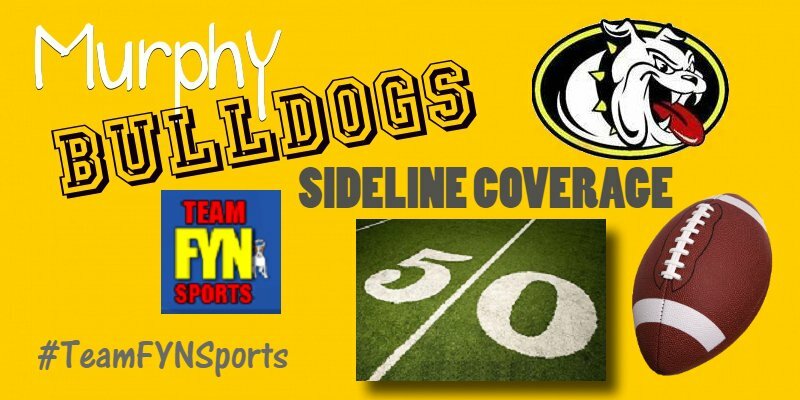 Come out and show your Bulldog pride tonight as The Murphy Bulldogs (7-2,3-1) set out to claim victory against The Rosman Tigers (2-7,1-3)! Tonight’s game will be a home conference game with kick off starting at 7:30 pm. 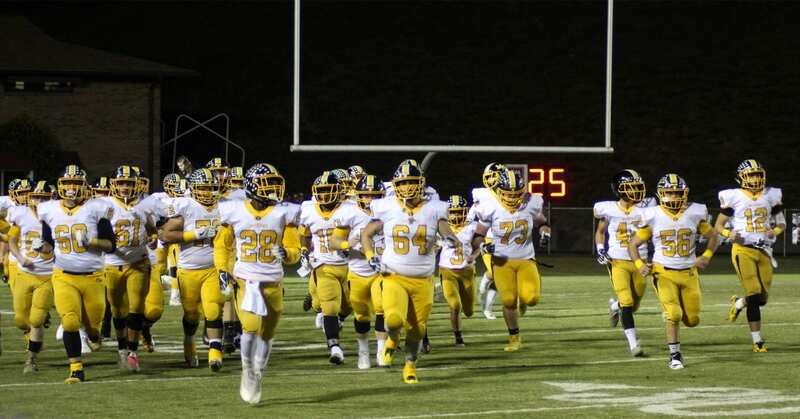 Although the Bulldog’s have been in the dog house since falling short against Swain County at last Fridays game, the Bulldog’s will prevail to no end! I’m sure Murphy will rise up with a vengeance, and dominate Rosman as they have done so in the past. So come out and show your Bulldog pride and team spirit! GO BULLDOGS! MURPHY, N.C.- It was a mean and muggy night full of humidity and emotions. A historic rivalry was gaining momentum, inevitably leading to an explosion under the Friday Night Lights of Bob Hendrix Stadium. Murphy wins the coin toss, and defers to the second half. Robbinsville received the kick off first, they bullied their way down the field , successfully converting on two 4th down conversions. The last conversion attempt ending up in a pitch right halfback pass to a wide open receiver, for a Robbinsville touchdown! PAT attempt was missed, put 6 on the board for the Black Knights. Bulldogs responded quickly, Kadrian “The Blonde Bombshell” McRae takes the ball on the kickoff return for an impressive, and exhilarating, 95-yard Bulldog’s touchdown! “Miss automatic” Katelyn Jones hits the point-after try to put the Bulldogs up 7 to 6. Robbinsville marches down the field, but the Bulldog defense was not having it tonight, they stop the Black Knights inside the 10, Black Knights opt to kick the field goal, and that puts our score, 9-7 Black Knights. Referees didn’t like the way the weather was looking, lightning in the background brought this game to a stand still, game was put on pause for about 30 minutes, referees decide to come back out and get this game restarted. Not long after game play resumed, Black Knights with the ball driving, huge knock-out blow delivered by number 58 Collin “the Nightmare” Cruise, resulting in a sack and a forced-fumble, recovered by the Bulldogs! “Captain Curry” Joey Curry throws a lightning strike of a pass down the field to number 4 Deandre “You Can Hate Me Now” Jackson for a 20-yard completion. Bulldogs within striking distance, Curry under center, takes the ball, quick outside pass, fires left finding number 12 Hagan “Ankle Breakin’ is my side job” Newton, makes one player miss, jukes left, hits the right trigger, and turbo boosts it into the end zone for a 28-yard Bulldog’s touchdown! Extra point is good by Jones 14-9 Murphy Bulldogs. Black Knights driving down the field inside the Bulldog’s Red Zone, yet again the Bulldogs mighty defense comes up big with the stop to hold Robbinsville to another field goal attempt, it’s good. Dogs still up 14-12. Bulldogs handoff right side to McRae, speeding down the right side of the field, breaks the tackle, pushed out of bounds at the Black Knight’s 15-yard line. 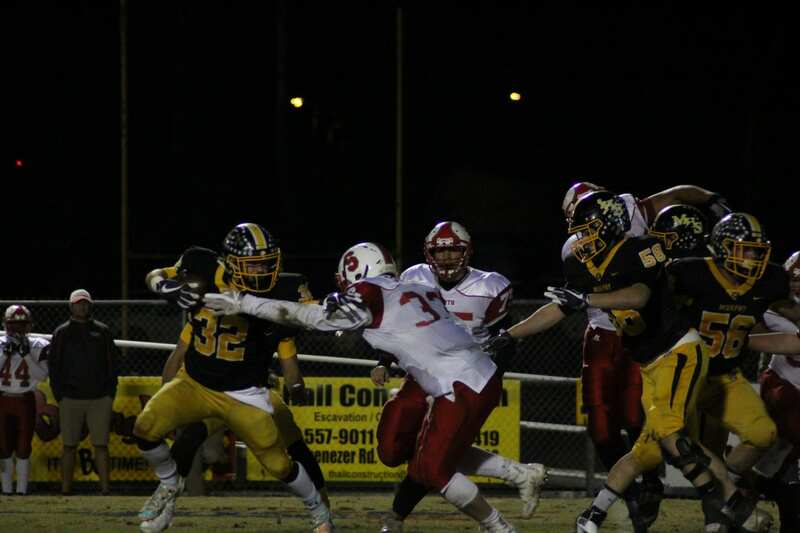 KJ “AKJ-47” Allen muscles his way in from six yards out running over Black Knights, he has the X-caliber! Hold the phone, penalty on the play! First and goal from the 3-yard line. Curry tries to run it in with a QB sneak, big pile up, we’re going to go ahead and call that a 2-yard gain, 2nd and goal from the 1. Bulldogs call time out to talk it over. 2nd and goal from the 1 Micah “The Mighty” Nelson powers it in over center, big pile up, referees clear out the bodies, they signal touchdown! Penalty on the Black Knights will be enforced on a kickoff. Devonte “Show Me The Murray” Murray kicks the ball down the field, Black Knights return stopped inside the 20. Second play of the Black Knight’s drive, interception Chase “The Snake” Roberts, for a Bulldogs first down! With the clock running down before half-time Curry throws one up for grabs in the back right hand corner of the end zone, intercepted by the Black Knights as the buzzer sounds, and the ticker strikes zero, bringing us to halftime. 21-12 Bulldogs on top. Second half of action starts off with a huge kickoff return by McRae 60-plus yards down the field. Black Knights penalty on the play puts the Bulldogs down to about the Robbinsville 24-yard line. First and Ten Bulldogs! Hand off left side, another penalty on the play, this time it’s on the Bulldogs. Holding is the call, puts the Bulldogs back at about the 34-yard line. Bulldogs under pressure, it’s 3rd and 19 to go, ball on the 34-yard line. McRae with another tough as nails power rumble, getting back all 10 of those penalty yards, and picking up another 6 more. 4th down and 3-yards to go, Bulldogs are going for it, Curry takes the pigskin bootleg right, hits the receiver H.Newton for the Bulldog’s first down! Bulldogs again threatening inside the Black Knight’s Red Zone. They are leaning on number 34 heavy tonight, another carry for seven yards, ball on the 6-yard line. 3rd down and 3 to go, Bulldogs marching. Hand off to Murray, tough one-yard gain on the play, 4th and 2 to go on the 5-yard line. Bulldogs choose to go for it again on 4th down. Bulldogs muscle up “It’s not marble, It’s Slade” McTaggart gets the ball down to the 1-yard line, first and goal Bulldogs! McTaggart gets the ball again, powers his way through the hole, touchdown Murphy! McTaggart comes up limping after the score. Jones lines up for the extra point, slams it through the uprights, Murphy Bulldogs up 28-12 with 6 minutes and 45 seconds to go in the 3rd quarter here at Bob Hendrix Stadium. After a Robbinsville 3 and out, Curry launches a 30-yard strike down the field inside the 5-yardline. Robbinsville stops the receiver on the 2-yard line. McRae takes the ball on the handoff, sprints right, and is stripped by the Black Knight’s ball hawking defense. Robbinsville recovers, 1st and 10 ball on their own 8-yard line. At the end of the third quarter ball is on the 17-yard line. Black Knight’s still have possession of the ball, 4th and 1. Robbinsville is going to go for it on 4th and 1 inside their own Red Zone, they are successful, and get the first down! They are marching down the field, clock is ticking, coming up on just over 9 minutes left in the game. Crossing the 50-yard line, ball on the 49, now is the time just under 9 minutes left in the 4th quarter, Robbinsville Black Knights need to strike quickly to get back into this one. Got another 4th down and 9 to go, ball is on the 48-yard line, they decide to punt the ball away, drops inside the 20, and the Black Knights get the friendly bounce, football wobbles down to the Bulldog’s 1-yard line. Bulldogs take over on their own 1-yard line. Murphy decides to put it in the hands of their running backs, good idea, powering out of their own Red Zone for a Bulldogs first down. Murray takes the ball out for a 9-yard gain on the play, Bulldogs killing the clock, 5:29 left in the fourth quarter of play, Bulldogs with the ball and a comfortable lead. Bulldogs up 28-12. Allen receives the handoff and charges through for a Bulldogs first down on 2nd and short. On first down Bulldogs go play-action, Curry hits his receiver for another first down and the Bulldogs continue to kill the clock. Clock running down with just over two minutes left in this game. You can pretty much call it, this game is over, barring any miracles from the heavens. Clock still running 3rd and 2, ball on the 48-yard line, penalty on the Play, false start on the Bulldogs. Robbinsville defense not giving up on 3rd and 7 stopping Murphy at the line of scrimmage. Black Knights call timeout. Murphy punts the ball down the field, Robbinsville takes over at their own 21-yard line. Another penalty on the play, unsportsmanlike conduct on Murphy, moves the ball up 15-yards to the 36-yard line. 49 seconds to go in this game, first and ten Black Knights. Robbinsville quarterback under pressure again, manages to escape the sack, but throws incomplete. 2nd and 10, time to go home folks, 43 seconds left. Pass incomplete, yet another penalty, this time it’s pass interference on the Bulldogs. Another penalty giving the Black Knights a free first down. 37 seconds left, and I’m wondering to myself, will this game ever end? Black Knights quarterback under pressure all night, scrambles right, fires it down the field, intercepted by the Bulldogs! Somebody call his Grandma, another big play by “The Blonde Bombshell” Kadrian McRae. Bulldogs take over on the 33-yard line. Curry takes a knee, time expires, and this game is finally over. Your final score, Bulldogs 28, Black Knights 12. Tune in next week as the Murphy Bulldogs travel to Andrews, to take on the Wildcats, it’s going to be a barn burner!